Astronomers have found a distant supernova, or exploded star, 20 times brighter than the Milky Way galaxy and 570 billion times brighter than the sun, according to research published on Thursday. Known as ASASSN-15lh, it is about 3.8 billion light years away from Earth, making it among the closest ever found in a class known as superluminous supernova, said the report in the journal Science. 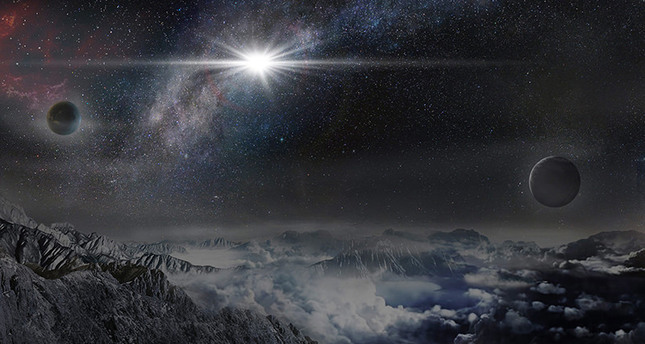 "ASASSN-15lh is the most powerful supernova discovered in human history," said study lead author Subo Dong, an astronomer and research professor at the Kavli Institute for Astronomy and Astrophysics at Peking University. At the heart of the supernova is an object that measures just 10 miles (16 kilometers) across. But it is 200 times more powerful than the average supernova, and 20 times brighter than all the stars in our Milky Way Galaxy combined, leaving astronomers puzzled about how it generates such energy. "We have to ask, how is that even possible?" said co-principal investigator Krzysztof Stanek of Ohio State University, which leads a project using a host of small telescopes around the world to detect bright objects in the universe, known as the All Sky Automated Survey for Supernovae, or ASAS-SN, pronounced "assassin." ASAS-SN has discovered around 250 supernovae since 2014, including the latest one which began to flare up in June 2015. It was first glimpsed by twin telescopes with 14-centimeter diameter lenses in Cerro Tololo, Chile. Astronomers spread the word about the sighting of ASASSN-15lh, soon more observations poured in from larger, ground-based telescopes around the world and NASA's Swift satellite. The 10-meter South African Large Telescope (SALT) observed the elemental signatures that verified ASASSN-15lh's distance and potency. "Upon seeing the spectral signatures from SALT and realizing that we had discovered the most powerful supernova yet, I was too excited to sleep the rest of the night," said Dong, who learned of the SALT results at 2 AM in Beijing on July 1, 2015. As to what could be powering the supernova, scientists remain stumped but hopeful that the Hubble Space Telescope will tell them more in the coming months about the supernova and the galaxy it calls home. "The honest answer is at this point that we do not know what could be the power source for ASASSN-15lh," said Dong. One theory is that the object at the center of the blast could be a very rare type of star called a magnetar, which spins rapidly and possesses an ultra strong magnetic field. But if further research shows that the object lies in the center of a large galaxy, then it may not be a magnetar after all, or even a supernova. Instead, it could be a sign of "unusual nuclear activity around a supermassive black hole," said a statement by Ohio University. "It would be something never before seen in the center of a galaxy," it said.